It’s possible to use predefined CSS3 themes directly from the ThemeRoller site. Downloading a predefined theme to your site will improve the speed of your application because the server won’t have to fetch the required files each time a user makes a request. However, if you want to use a custom theme, you must create and then download it for use on your site. In both cases, using a downloaded copy of the theme reduces potential security risks because everything needed for the application is downloaded from a single domain. The use of a single domain makes it possible for the administrator to lock down the browser better and reduce the risk of cross-site scripting problems. Click Download under the theme you want to use. ThemeRoller displays the Download Builder page shown. Select the version of the theme you want to use. The default version is the best option in most cases. However, you may need to download an older version to support older applications. Select the features you want to use from the library. In most cases, you want to leave all the feature options checked when downloading a development version of the theme — because you don’t know, at the outset, which features you really need. When you complete the development process, you can create a smaller version of the theme by selecting only those features that your application actually uses. The smaller version will download faster so that the user sees results quicker. (Optional) Type a value in the CSS Scope field. The scope makes it possible to override internal CSS styles using an external .CSS file. You can read more about the use of scope at css-tricks and html5rocks. Some developers have complained that the scoping feature doesn’t work completely in ThemeRoller. You can see one such example at jqueryui.com. You see a download dialog box for your browser and platform. The file you receive is an archive that contains all the special features you requested during the configuration process. In order to use a custom theme with your application, you must download it. There aren’t any URLs you can use to access the theme from the ThemeRoller site. The following procedure helps you download a custom theme. Click Download Theme in the ThemeRoller menu. 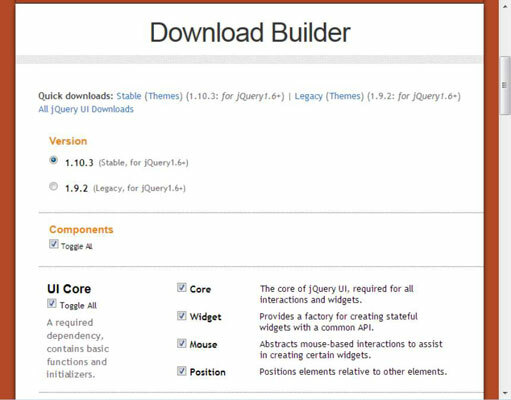 ThemeRoller displays the Download Builder page. Because this is a custom theme, you need to download all of the features for development purposes to ensure you have a complete setup. Unlike a predefined theme, a custom theme makes it harder to go back later and obtain items that at first you thought you wouldn’t need but ended up requiring. Yes, you can use the URL you saved during the creation process to reproduce the theme, but this means keeping the URL in a location that you can remember. When you come up with versions of the theme that you want to keep, saving them at the outset is always a better idea. Type a name for your theme in the Theme Folder Name field. Select a unique name for your theme that reflects the design or purpose of the theme. Otherwise you may end up with a number of custom themes that are hard to identify later. You see a download dialog for your browser and platform. The file you receive is an archive that contains all of the special features you requested during the configuration process.